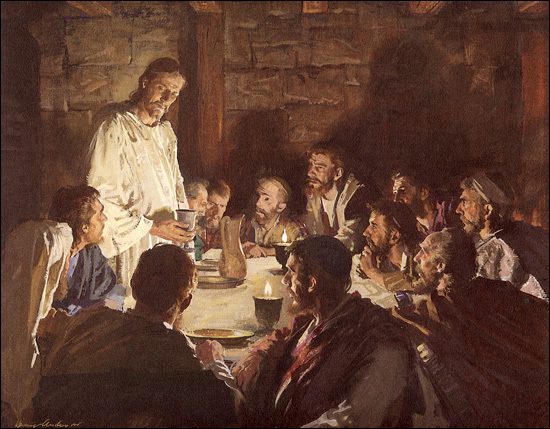 Maundy Thursday sermon, March 29, 2018. There are many stories and verses in the Bible that do not, at first anyway, seem to make much sense, do not fit in with the rest of the story, or appear to contradict other parts of the Bible. In fact, when one reads the Bible for the first time, one may even be overwhelmed by the many problems encountered. When this happens, we must have a bit of humility in our approach, realizing that the Bible is a big book, written a long time ago, into a very different culture; and, it is about the Almighty God of the universe. So it shouldn’t surprise us that there are things we are not going to understand the first time through. If parts of the Bible seem strange or unreasonable, we should not then right away call God’s Word into question, setting ourselves up as judge and jury over it. Rather, we should realize that the problem might be in us, and in our own lack of knowledge, insight, or perspective. There have been dozens of verses like that for me—verses that at first seemed just plain wrong, until I learned more and my understanding deepened. What often happens then is that I learn something from a verse I first thought to be incomprehensible. There is such a passage in this in Matthew 26:21-22. Jesus is enjoying a peaceful Passover supper with his disciples. It was the meal that turned out to be known as ‘The Last Supper,’ but the disciples did not know that yet. It was the calm before the storm. Within the next 24 hours Jesus would be arrested, tried, convicted, sentenced, tortured, and then crucified and buried. But all was quiet now. That is the difficult verse. What do they mean, “Is it I, Lord?” The deed has been done, the evil plan is already unfolding, the soldiers are on their way; and each one can’t remember whether or not he was the one who did it. Why not? I have at times been accused of being absent-minded, but I am sure I would remember if I had betrayed my good friend. Why the uncertainty? We would much more expect a response like, “Okay, who is the dirty rat? Let me at him.” We might expect that Peter for sure would have been rolling up his sleeves and putting up his fists for a fight with someone. But why in the world would they all sit there looking dumbfounded and saying, “Is it I, Lord?” Certainly a person would remember doing something like that. Well, there are two answers that come from further reflection on this text—one, fairly simple, and the other, deeper and more significant. First, the simple explanation. At this point in the evening, only Judas and Jesus knew what was coming next. All the disciples knew that things were getting a little tense in Jerusalem, but only Judas and Jesus knew that the soldiers were at that very moment getting ready to go to arrest Jesus at the Garden of Gethsemane (the place Judas revealed to the authorities in his betrayal). Therefore, when Jesus said, “One of you will betray me,” the other eleven had no idea that the deed had already been done. For all they knew, Jesus was talking about one of them falling away and betraying Jesus next year, or in five years. Let’s imagine what might be behind that response. Perhaps they all have had their times of doubt, perhaps they have been confused by Jesus, perhaps their faith has, at times, wavered. Perhaps by now, after three years with Jesus, they know the depth of their sin and weakness. They have already made so many mistakes and misunderstood so much. Jesus had always warned them to watch, to be prepared, to stay on the narrow path, to not be deceived by pride, and to not give into temptation and fall away. They knew by now that faith was not a casual matter to be taken lightly, but much was at stake, and it wasn’t easy. They had everything to gain by remaining faithful, and everything to lose by falling away. Not only that, but they had seen the fickleness of the crowds who came and went, who believed in Jesus one day, and turn their backs on him the next. They perhaps wondered if that might one day happen to them too. If they had learned anything from following Jesus, they learned to be humble, and not self-righteous.